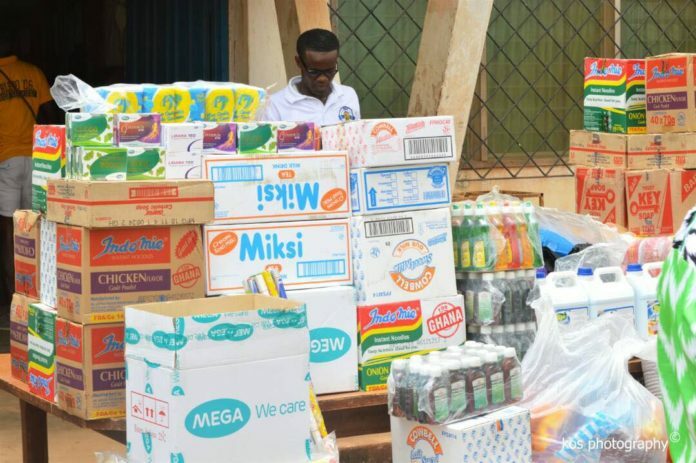 The 2006 year group of the Accra Academy , known as ‘’Bleoo 06’’ on Easter Monday donated items worth over Ghc 15,000 to the Pantang Hospital in Accra. The donation which was supported by Promasidor Ghana Limited and Mega Life Sciences was part of the old boys associations’ planned social responsibility. Promasidor supported with cowbell products ,Mega Life sciences provided medications while the Bleoo 06 year group put together some toiletries for the inmates of the hospital. ‘’Easter is a season of sacrifice and of love and these mentally challenged individuals are usually down the pecking order of the list of beneficiaries when it comes to such donations. As a group groomed with a selfless philosophy, we decided to pull resources together and offer support to our brothers and sisters suffering from this peculiar ailment. One of the Accra Academy’s latin motto’s ‘’Non sibi sed aliis’’ translated as ‘’Not for self, but for others’’ makes us always look out for the underprivileged in society and offer our best support when we can’’ said Mr. Nii Sekoh Abbey-Ashong, President of the group. The Pantang hospital was opened by General I.K.Acheampong in 1975 and was headed by Dr.Sika-Nartey,a Psychiatrist. The hospital is situated near a village called Pantang,about 1.6 kilometres off the Accra- Aburi road and 25 kilometres from Accra Central. The hospital was originally planned to be a Pan-African Mental Health Village. Although very popular, this hospital and mental support home is on a steep decline as it lacks support from both the public and private sectors.